Will Appraisals Continue to be a Challenge in 2016? First American Title issues a quarterly report, the Real Estate Sentiment Index (RESI), which “measures title agent sentiment on a variety of key market metrics and industry issues”. Their 2015 4th Quarter Edition revealed some interesting information regarding possible challenges with appraisal values as we head into 2016. This shouldn’t come as a surprise. In a housing market where supply is very low and demand is very high, home values increase rapidly. One major challenge in such a market is the bank appraisal. If prices are jumping, it is difficult for appraisers to find adequate, comparable sales (similar houses in the neighborhood that closed recently) to defend the price when performing the appraisal for the bank. 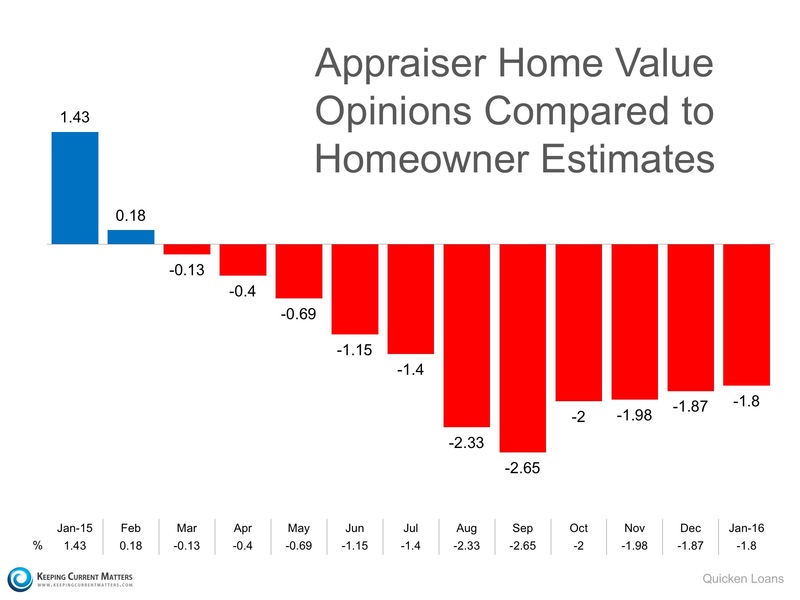 Another monthly report by Quicken Loans measures the disparity between what a homeowner believes their house is worth as compared to an appraiser’s evaluation. Here is a chart showing that difference for each month through 2015. Every house on the market has to be sold twice; once to a prospective buyer and then to the bank (through the bank’s appraisal). With escalating prices, the second sale might be even more difficult than the first. That is why we suggest that you use an experienced real estate professional to help set your listing price. Whether it’s an Open House, or simply presenting your home in the best light, it is necessary to view it from the eyes of a buyer! Any money spent in this area may result in increased profits and a faster sale. These tips can help ensure you receive the highest price possible for your home. How Do You Value A Property? If you are asking how to determine a property’s value, there are various ways to assist in detemining a property’s value. Ultimately the worth is determined by what was paid for it. How you gather information on what to pay for it depends on what you require the value for. The value of the property, no matter how the info is gathered, should be at or near the same price, no matter which tools you use. a) Only use comps within a half mile radius of your subject property, this helps ensure you are using properties that actually fall within the same parameters (builder, style, year built, etc) of your subject property. It isn’t fool proof, but that’s where your knowledge of the area and market should kick in and adjust for any discrepancies. b) Keep your filters (min/max sq ft, year, bed/ba, etc) as close as possible to the subject property for the best determination. For example, If your subject property is 1400 sq ft you would be doing an injustice to set your filters at min1000 sq ft and max 1800 sq ft because once you add or subtract 200 or more sq ft to a home (the size of another room), the case could be made that that home now is automtically valued less than or more than your subject property. In the event you need to contest a value determination by a lender (in the case of a short sale), you will be able to make a better case when you use “cleaner” filters. c) Never tweak your CMA. In this current market, the decision makers are the lenders, not the sellers. All lenders have recruited the assistance of other agents (BPO agents, such as myself ) to ensure they are either getting the correct value to help mitigate their loses, or in the case of a buyer, are making the loan at the appropriate risk value. The bank that I do BPOs for is Bank of America (Landsafe Appraisals), and they have tightened down on their BPO agents so much so that they have actually let some agents go, and they monitor your BPO results on a regular basis to ensure you are being consistent in your formula, as well as share best practices for determining value. 2. Appraisal – These are completed by a licensed appraisal professional and the results are much more detailed than in a CMA and as a result can be used to contest a CMA or BPO if necessary. 3. BPO (Broker Priced Opinion) – Typically requested by Senior lienholders, these reports are usually completed using the senior lienholder’s BPO company’s form (usually electronic and online). A pretty detailed report, asking for info such as can you determine if the property is vacant or occupied, most recent comparable three “solds”, most recent comparable three “listeds” – dates listed/sold, year of build, beds/baths, sq ft, miles from subject property, etc), and normally includes pictures of the subject property, and sometimes pictures of the comparables. Here is a short sale negotiating tip on BPOs: Currently, these reports are updated normally every three months. That is good information to know when you are negotiating and come to a bump over price. Sometimes a three month old report can mean the difference between a denial (if the buyer’s offer is too low), and an approval (if an updated BPO is completed and comes back slightly lower). Just to reiterate, whether you are on the REO side, short sale side, or buyer side, the lender has the final say, and they are scrutinizing values more now than before – and rightly so. So just remember to keep your value determinations above board and you will be making the best decision for all involved.